OR: Following the Trail of Katsushika Hokusai! The day started by saying goodbye to the crowds swarming around Sensoji Temple in Asakusa and walking across Azuma Bridge into the heart of the oldest part of the shitamachi (downtown) part of Edo (as Tokyo used to be known). 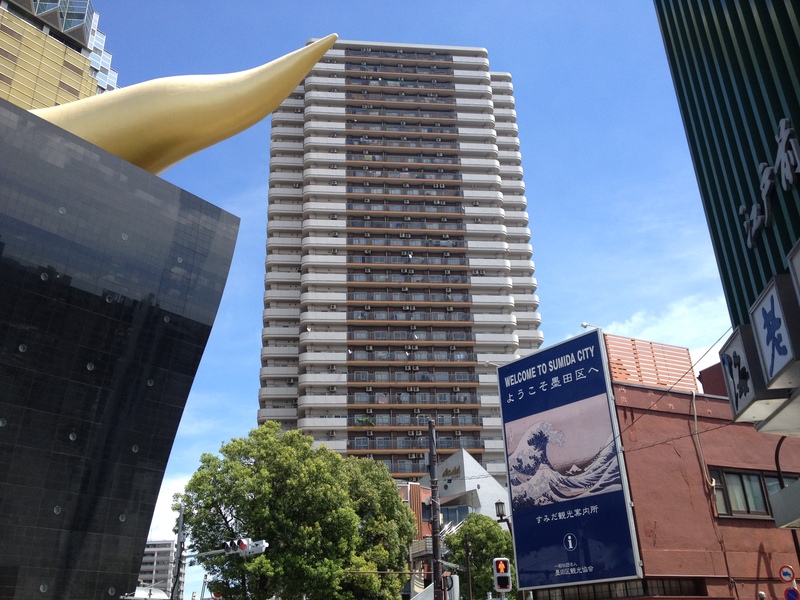 Behind the Sumida ward city hall and the famous Golden Turd on top of Asahi Beer head office, lies Mukoujima – the name means ‘the island over there’. This area is historically famous for a number of reasons, one of which is that it used to be the home of Katsushika Hokusai. Readers of this blog will know that he’s the Ukiyo-e artist who plays a major part in Book Two of my urban fantasy trilogy, “Sword, Mirror, Jewel”. So, during the dog days of Japan’s O-Bon vacation period, I thought I’d scout a few Hokusai locations that I hadn’t been to before. 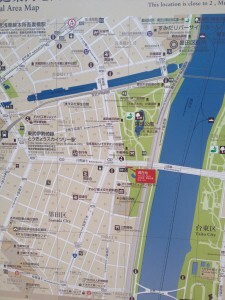 If you turn left before the Asahi golden turd, a road takes you along the Sumida riverbank, and under the Shuto highway flyover. 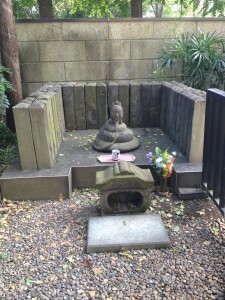 A short walk brings you to the peaceful green haven of Sumida Park, and a shrine that featured in a few of Hokusai’s prints – Ushijima Jinja. 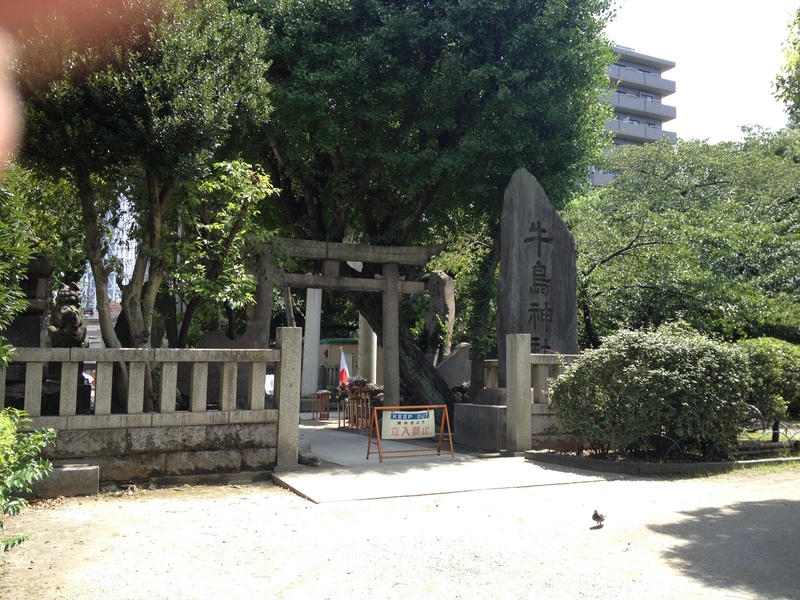 On this day – August 15th – the shrine was conducting a ceremony to commemorate the end of WWII. 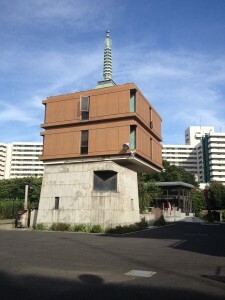 A big Keep Out sign had been placed across the front entrance, but it was possible to see inside the courtyard … white-shirted veterans sat patiently on folding chairs under electric fans working overtime, while Shinto priests in full regalia blessed them with the sacred sasaki paper wands in the blinding sunlight. No photos, sadly, because it seemed kind of disrespectful. To the right of the main building is a hut that used to contain a black stone cow called the ‘caressing cow’. It was given to the shrine in 1824. It was believed if you stroked the part of the cow’s body corresponding to your own ailing part, you would be cured. This is why the old name of Ushijima used to be Ushinogozen – ‘before the cow’. 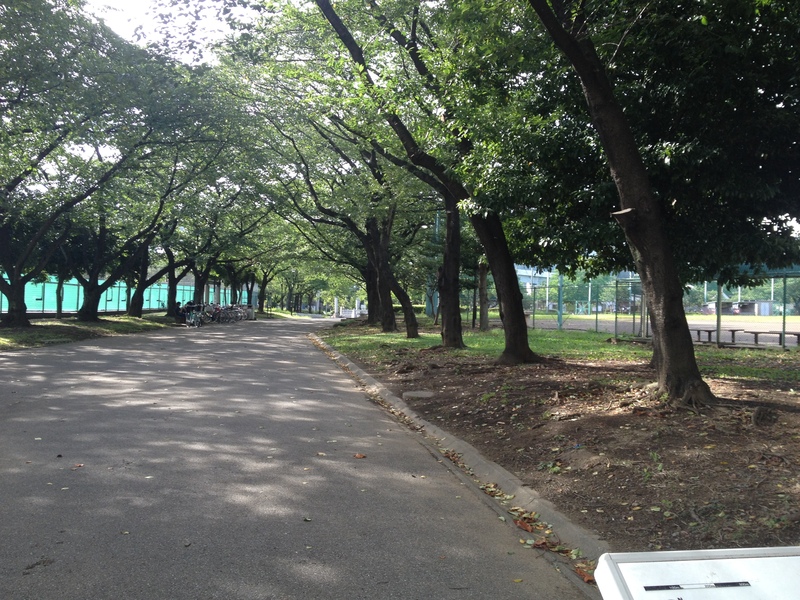 I left the park and headed for the next Hokusai-related shrine. Between the river and the main road running through Mukoujima lies Mimeguri Jinja (the name means Shrine of the Three Circles). It’s home to three deities – Daikokuten, the god of wealth and the household; Ebisu, the god of fishermen, luck, and workingmen, and Inari, the god of rice. Daikokuten and Ebisu are two of the seven gods of good fortune in Japanese mythology and folklore (the other five being Hotei, Jurōjin, Fukurokuju, Bishamonten, and Benzaiten). Inari is commonly depicted in the figure of a Kitsune, or fox, and is deified in two small shrines behind the main building. The atmosphere in this outer sanctum is redolent with mystery; the larger of the shrines is guarded by a family of moss-covered stone Kitsune, a tunnel of orange torii gates, and two blackened statues depicting a pair of Edo sorcerers said to have the gift of speaking the secret language of the foxes. In Hokusai’s day, this part of Mukoujima was mainly rice fields, so it was vital to have a shrine where folk could pay their respects to the god of rice. 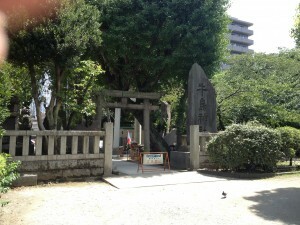 The next shrine featured in Hokusai’s prints is Shirahige Jinja, and it’s quite a long walk down Mukoujima’s main road. 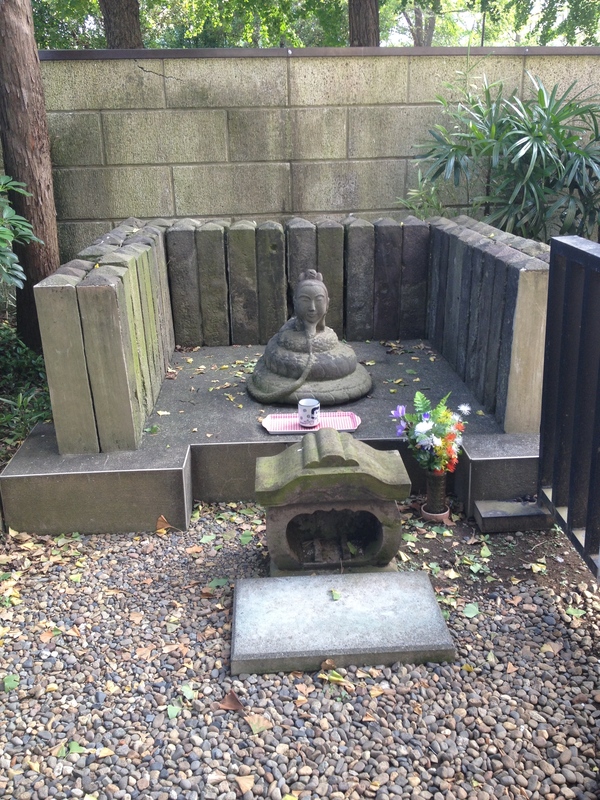 The name means “Shrine of Whitebeard,” mainly because it’s devoted to Jurōjin, the god of long life and health. One problem was, I didn’t feel too healthy after being out in the sunshine dodging from one patch of shade to another. I had UV spray, sunglasses and a Panama hat, of course, but even with them Tokyo in August is a pretty uncomfortable place to be. 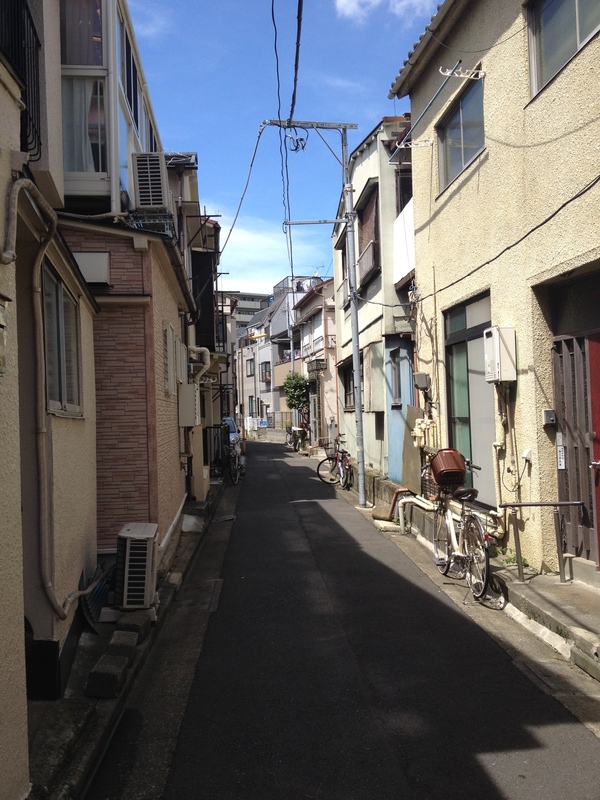 Other problems were mounting up; after Shirahige Jinja, I’d got lost in the meandering streets of Mukoujima (okay, it was an educational experience, not really a problem). 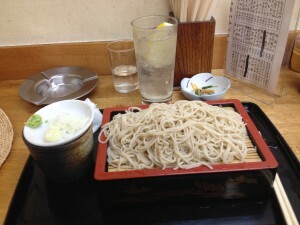 It was also lunchtime and many of the little noodle and sushi shops were closed because of the O-Bon summer vacation. Eventually, I came to a crossing between two main roads that looked promising, and down the street I saw a big sign with SOBA painted on it. Saved! This was a shop named Kamimura, an old but spotlessly clean establishment which had only three customers inside (including me). I decided to cool off with some chilled mori-soba and a big glass of lemon-hai filed with ice. It was the best thing I could have done. After a relaxing lunch and a chat with the staff, I found out that Kamimura was very close to Higashi Mukoujima station on the Tobu line – as well as the Tobu Transport Museum. It seemed to be a good idea to take a break for a while from the Hokusai trail and get out of the sun – so a five-minute walk and two hundred yen later, I was inside again doing some steam train spotting. The Tobu Transport Museum has some vintage steam and diesel trains from the thirties, forties and fifties, but it’s not in the same league as the London Transport Museum. I was looking for some vintage Art Deco posters and displays – the kind that British transport was so good at, back in the day. Sadly, I couldn’t find any. Not even postcards. By this time it was three o’clock, and I was close to a train station. From looking at the map, it seemed that the next stop on the line was very close to the last stop on the Hokusai trail – Sumidagawa Shrine. I decided to cut to the chase and take the easy way out; the afternoon heat showed no sign of slackening off. The next stop in question is called Kanegafuchi, and Sumidagawa Shrine is located ten minutes walk from the station in the middle of Shirahage Park. 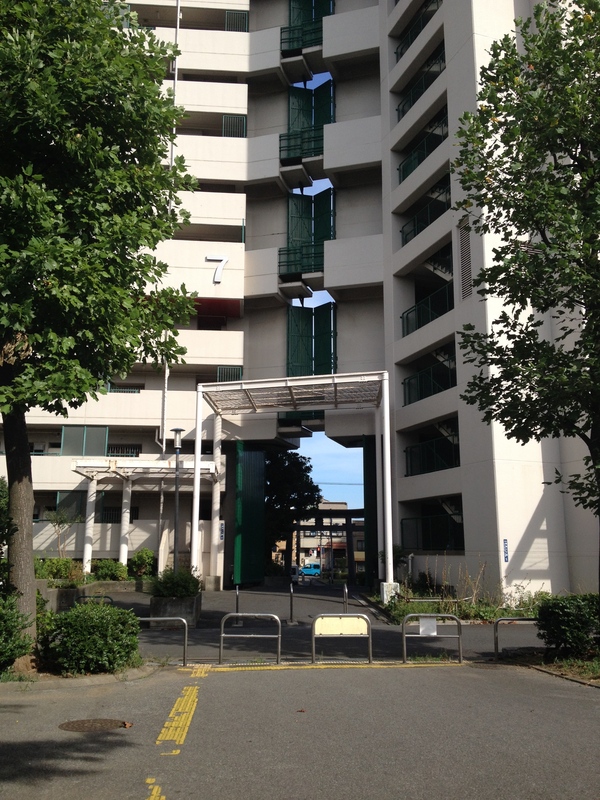 The park in question lies between a huge suspension bridge and equally huge danchi – tower blocks of public housing complexes that look like something straight out of Truffaut’s “Fahrenheit 451”. I wonder what Hokusai would have made of these, I asked myself. Sumidagawa Shrine and Shirahige Park is the location of a TV samurai drama called “Kenkyaku Shoubai”: although the series is filmed in the studio and in distant parts of the Japanese countryside, the house where the central character lives is named as this part of Mukoujima. Regarding the curious temple named Mokuboji, just a short walk across the park … I would dearly like to know the reason for the cube-shaped building that dominates the precinct … and I would also like to know the story behind this snake-bodied Yokai here! Experience the world of Hokusai and the Sword, Mirror, Jewel trilogy! grabbed a person’s attention? 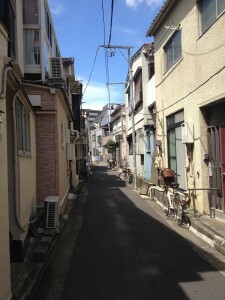 I mean Excalibur Books | A Days Walk Through Mukoujima is kinda vanilla.